Whenever we hop over the channel to France, I always buy a packet of sablés. 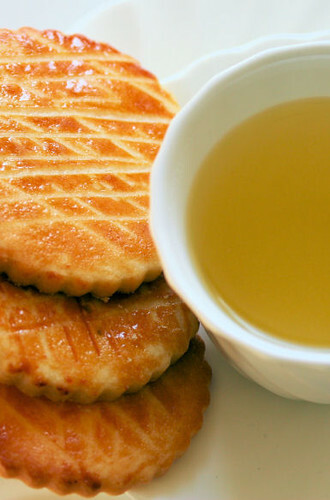 These French buttery biscuits have a caramel glaze, are crisp, light and not overly sweet. I did notice that the supermarkets sell them here now, but they are very easy to make at home. The best thing is that you can use up your leftover egg yolks from making your macarons that are the fashion these days. I did have a couple of issues with the recipe (caramel & glaze going lumpy) but the end result didn't suffer. Adapted from The Cookie and Biscuit Bible. Put the flour, pinch of salt, icing sugar and butter into a food processor and process until you have a mixture that resembles fine breadcrumbs. Add the egg yolks and vanilla, then pulse until the mixture comes together as a firm dough. Wrap up in cling film and chill in the fridge for about 15 minutes. While the dough is chilling, make the caramel syrup. Put the granulated sugar and 20ml of water into a small pan and gently heat until the sugar has dissolved. Turn the heat up and boil until the sugar is turning a golden brown colour, remove from the heat immediately and put the saucepan into a bowl of cold water to stop it cooking. Add the 50ml of water and set aside to cool. 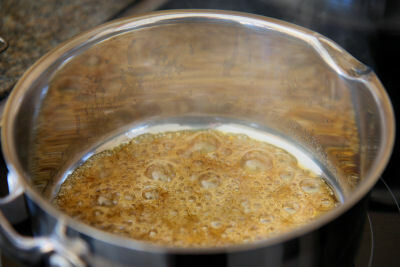 If the caramel goes hard when this water has been added, place the pan on a gentle heat and stir until it has completely dissolved. Put it back to cool. 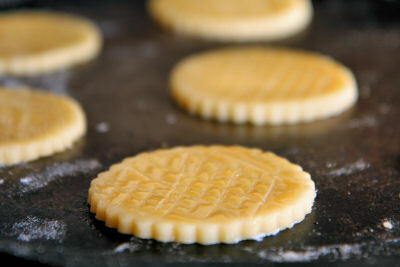 Roll the dough out to a thickness of about 4mm and cut out using a fluted biscuit cutter, I used a 55mm one, which made about 25 sablés. Place onto non-stick baking trays, or line them with baking parchment. In a small bowl, beat the egg yolk together with 15ml of the caramel glaze. Mine went lumpy and I had to sieve it through a tea strainer before using. You will have some leftover caramel glaze, which the book says you can use to flavour fruit salad, and especially oranges. Brush the glaze over the cookies and leave to dry, then apply another thin layer of glaze. Drag a fork over the glaze in both directions to make a checked pattern. Put the trays into the fridge while the oven heats up. Heat the oven to 180ºC/350ºF/Gas 4. Bake the cookies for about 10-15 minutes, or until crisp and golden brown. Remove from oven and transfer to a wire rack to cool. 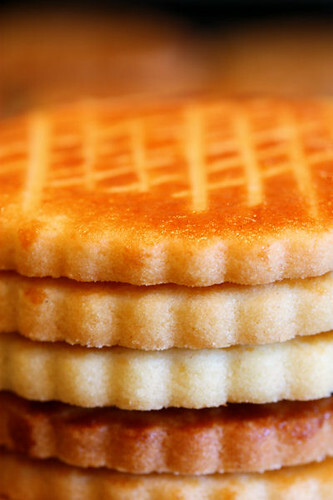 What a gorgeous biscuit. I don't think I have ever had one, but I think it is time to try! Great use for yolks Nic. Between you and me, I am sure you can imagine why I have them in surplus! Yes indeed, the mac fairies have abandoned me and I battle on! Love the designs on top... novel idea and ever so pretty! These look wonderful, you're making me want to hop over the channel myself. 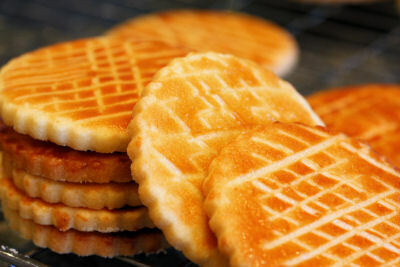 Waw,...these cookies look so fantastic & amazing!! Yummie,...all the way!! tasty with a good cup of coffee! these little discs must just dissolve on the tongue in the nicest way, leaving behind that awesome caramel flavor. really beautiful work, nic! I haven't had Sables in ages! Nic, these not only look perfect but I can just imagine how good they taste. What a lovely idea Nic. They look so pretty. I haven't had sables for a while now but oh these are so pretty! And I'm feeling a French wave now after reading this. Time to get some sables, macarons and croissants! These look so perfect - if it wasn't sacrilegious to say so, they almost look like they came out of a packet - only better of course! Beautiful! And that caramel glaze is a great idea. Like everything you make these are sooo pretty. I love the taste of sables and the way the dough holds its shape. Wonderful! In the past, I have had bad, bad luck making sables, but I shall try your recipe, for it may be the one that works for me, and the look delicious! Ooooh now I do like the look of these Nic - yum! Your sablés look amazingly good Nic !! These are so pretty and perfect. Interesting idea… This looks delicious. Amazing cookies. Thank you so much for the recipe! It's a little hard to work with the dough, but I rolled it out using two sheets of parchment paper and that worked. 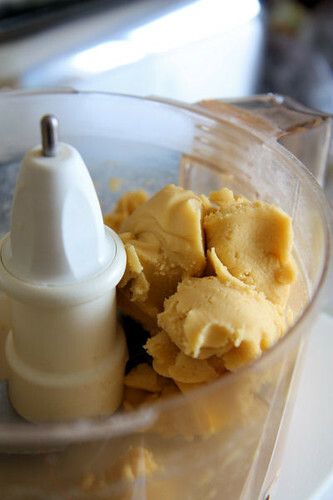 I also used a mixer instead of a food processor, since I don't have one. Doris from New York City. Cherrapeño Visits Miele in Germany!